Fish make up an important part of a healthful diet, and you should eat it twice per week, advises the American Heart Association. But some types of fish should be eaten in moderation because of their mercury content. The New York City Department of Health and Mental Hygiene classifies snapper as high in mercury and recommends limiting your high-mercury fish intake to one serving per week. When consumed in appropriate amounts, however, red snapper boosts your nutrient intake and contributes to a balanced diet. Each 6-ounce serving of red snapper boosts your calorie intake by 170 calories -- 9 percent of your daily intake, if you follow a 2,000-calorie diet. Just shy of half these calories come from the snapper's 35 grams of protein. The protein in your diet not only helps maintain strong tissues, including your skin and muscles, but also it also helps you make enzymes and hormones that support your health. Like other animal-based proteins, red snapper contains all nine amino acids you need to consume as part of your diet, making it a "complete" protein. Red snapper comes loaded with essential vitamins, particularly vitamins D and E. Each serving boasts 694 international units of vitamin D -- more than the 600 IU you need each day -- along with 1.6 milligrams of vitamin E, or 11 percent of the recommended daily intake. Red snapper's vitamin D content keeps your bones strong, because it helps your body absorb and use bone-building calcium properly. Vitamin E supports healthy red blood cell growth, which aids in oxygen transport and also offers antioxidant protection for your tissues, which might help fight chronic disease. 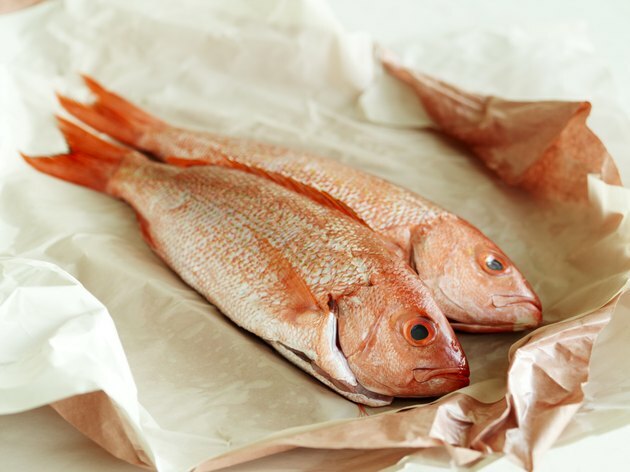 Add red snapper to your diet as a source magnesium and selenium, two essential minerals. Like vitamin E, selenium shields your tissues from damage because of its role as an antioxidant. It also keeps you healthy by promoting immune function. A serving of red snapper contains 65 micrograms of selenium, which is more than your daily selenium requirement of 55 micrograms. The magnesium in red snapper helps you produce energy and maintains strong teeth and bones. Each 6-ounce portion of red snapper contains 54 milligrams of magnesium -- 17 and 13 percent of the recommended daily magnesium intakes for women and men, respectively. Red snapper serves as a good source of omega-3 fatty acids, a family of fats you need to obtain from your diet. Each portion of red snapper contains 0.4 grams of docosahexaenoic acid, or DHA, and 0.1 gram of eicosapentaenoic acid, or EPA. This DHA plays a role in brain function, and getting enough of it in your diet might lower your risk of Alzheimer's disease. Both types of omega-3 fatty acids benefit those suffering from diabetes and help improve blood lipid levels.